It's been lovely and sunny here today after our big storm, but very cold and blustery. 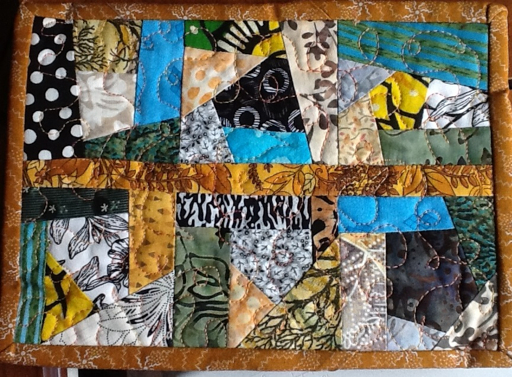 I did a couple of errands this morning and spent the afternoon in my sunny sewing room. 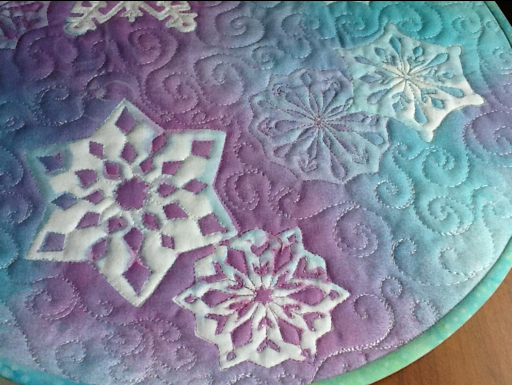 I decided to scatter some little free motion stitched snowflakes across the topper. I want to bind it with bias binding but have nothing the right size or color so I cut some strips of white and I'm going to try to spritz them using the same colors as the topper. Then after all that tiny controlled stitching, I decided I needed to loosen up. I dragged out some scraps and started stitching crazy patch style. The plan was to make a mug rug. It's a bit big but I'm free motioning it anyway. It will fit someone's table. I think it's about 10 by 10"or so. Now that I have the idea, I'll make a smaller one. 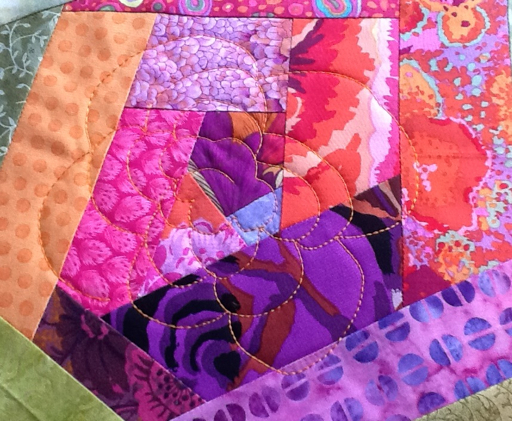 Next, I wanted to free motion quilt it with the Wonderfil Accent thread I'd been saving. On my last experiment with the thread, it kept shredding and breaking. I figured it was because I didn't have the right bobbin thread so I ordered some. I thought it was going to be good but then the same thing started. I changed the needle several times, checked the tension, all to no avail. I'm stumped and wondering of it could be something with the machine. I did have it serviced not long ago though. Maybe I should pull out my little workshop machine, the Jem Gold and try it. Perhaps I'll try that next. We're staying in tonight; maybe we'll look for a movie, or maybe we'll simply watch the festivities. Tomorrow will be spent doing what we love, snowshoeing if its nice, and having a quiet supper. As for resolutions, I've given up on those. I read somewhere about intentions and I like the idea. I intend to do the same in 2013 as in the past year. I will spend time each day in a creative endeavour, make exercise a priority, try to eat healthy, and try to avoid unnecessary purchases. I will find joy in the little quiet moments. It's been snowing and blowing all since sometime in the night. We're waiting for it to abate so we can get out and do some snow blowing. This is the view from my dining room window. 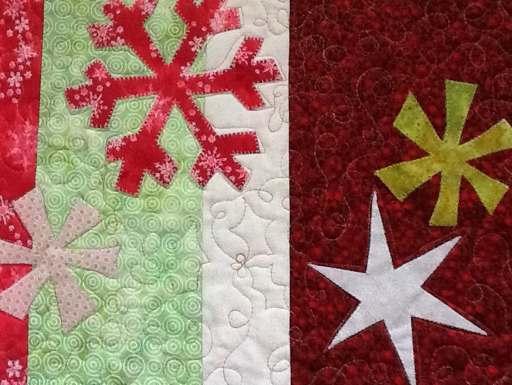 I've spent the day listening to some new CD's while free motion stitching and quilting my snowflakes. How appropriate! I think I may have to use the envelope method to finish this one as I can't find an appropriate fabric large enough to make a bias binding. You can't tell here but it is round. On the postcard size piece, I decided to add some beads. G and I got out for a walk on the trail today before the next snow comes to-night. I love this view as we come around the bend. 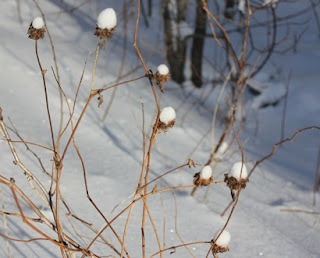 I thought the seed pods looked like they were all wearing hats. I love this old tree with the woodpecker hole in it! I hope I can get some sewing time tomorrow in between snow blowing! My youngest son left today. He blew the driveway and his fiancé shovelled before they left since my husband isn't allowed after the gall bladder surgery. I went out for errands and had to park on the street when I returned because the plough had gone by. 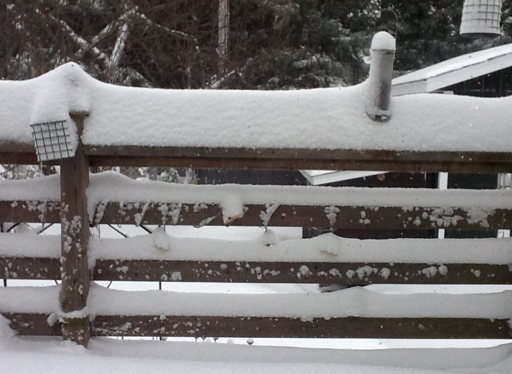 So my husband came out with me and showed me how to use the snow blower. It's a very old, heavy one, but I handled it fine. The hardest part was squeezing the handle to make it go; my hand cramped. 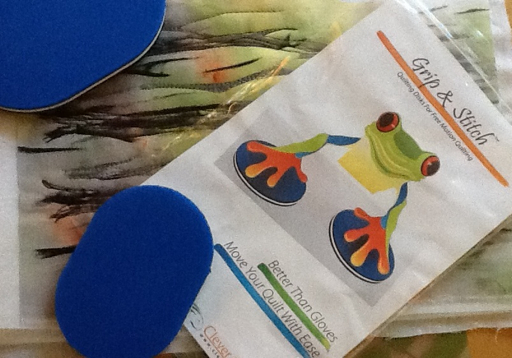 I showed a small peek of these table toppers before Chritmas. Now I can show you the whole photo. This one I made for the son with the round table. This was for the youngest son and his fiancé. 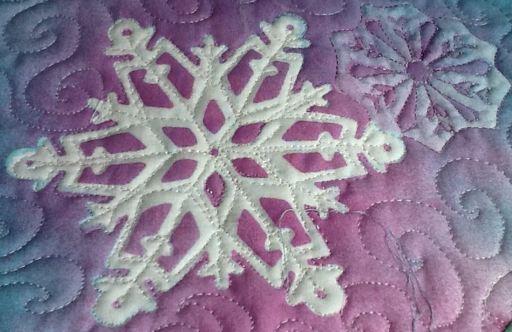 The snowflake patterns and measurements for the runner came from Quilting Arts in a newsletter. I purposely went a little funky with the fabrics and didn't use Christmas fabrics, so they could be used longer. My oldest son and his wife left this morning, so it's quieter with only the youngest one and his fiancé left. They just got engaged on December 22nd and we are so happy for them! They have been dating for over 5 years. Josee Anne just finished her nursing degree. 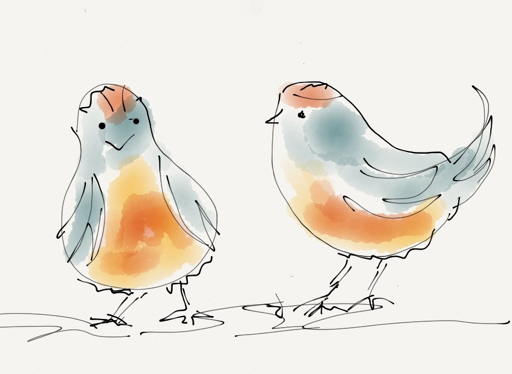 I'm still playing with the Paper 53 App and musing about how I can use it in my textile art. We took my son and his wife for a walk on the trail just after lunch when the day was at its warmest. It was a mild -4C, but for them it was cold. The weather is much milder where they live in Lunenburg, about 6 hours south of here. We enjoyed feeding the chickadees. 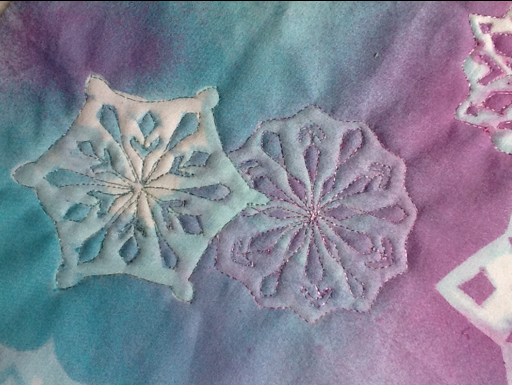 While everyone was doing their own thing later, I went into my sewing room and sandwiched the second snowflake piece that I just painted the other day. I like the colors better on the first I did, but it's still pretty. I think I'll try one more before I move on to another motif. Then, while I was waiting for updates on my computer so I could upload some new music, I started the stitching. I came across this App, Paper 53 on a couple of blogs this week and I decided to buy it for myself for Christmas yesterday. I tried the free app first but you're limited as you can only write or draw in black. However, it did give me a fell for how it would work. I like the gestural qualities you can get with it, especially when using a finger as opposed to stylus. There are a couple of erasure marks in this but you get the idea. Maybe they'll be some fabric designs that come from it. Sometimes on paper ! can get all tight and detailed with a pencil. It's quite freeing to use the finger tip and you can erase it if you don't like it. I'm having fun with it! I think I saw a mini I pad advertised. Wouldn't that be fun to carry around! 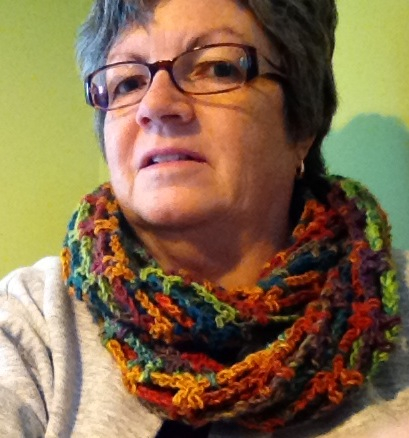 I did mention that I'd show the scarf once I finished so I'm trying to ignore my dislike of pictures of myself to show you. I've been wearing it and have had several compliments. I think, though, that I will purchase another ball and add a few more rounds. 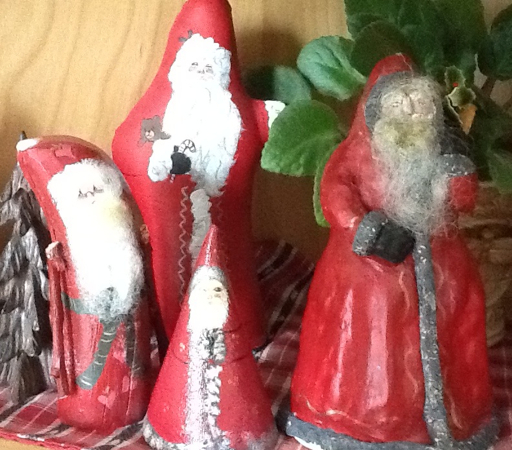 I thought it would be timely to show a sampling of my small Santa collection. these ones i made myself about 25 years ago.The one on the left is made from driftwood, the two middle ones are made from canvas ( one is stitched and stuffed) and the one on the right I made from moulded clay using the coil method. It was then fired and painted. That's a bit of real wool roving that I used for the hair and beard. I thought I'd share a recipe for a very light and simple steamed pudding that I got from a friend a few years ago. I used to make our family's version of a plum pudding full of sugary sweets and topped with lemon sauce and hard sauce. Then I tried this one. It takes about 10 minutes to make and seems a little less sweet with the fresh cranberries. I just made it this morning. Last night I started crocheting this scarf. Found the pattern here. I'm making mine with a Bernat acrylic yarn because as much as I love the beautiful wools out there, I can't wear them around my neck. I can wear wool socks and mitts thank goodness. It really is incredibly easy and fast! I've been away from the blog for a few days. There's been a bit of the usual seasonal busy- ness, but I have been finishing up a few gifts which I couldn't show. Also, my husband had his gall bladder out on Monday. Wow, how much less invasive they are these days! He had the surgery at around 10:30 and I brought him home around 3:30. 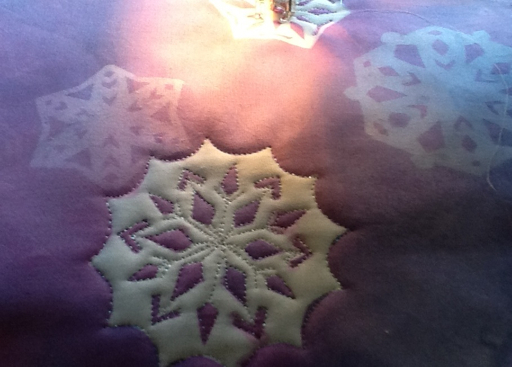 This afternoon I sat down, finished the quilting and added the binding to my snowflake topper. I just have to do the hand stitching on the binding. This piece is for me and I am so happy with it! I think I may try a couple more pieces using this method. The threads you see are from the needle and thread to stitch the binding. I was so anxious to show it! Well, I'm ready for Christmas now except for a few little things. My two boys will be home with their partners for several days, so I'm looking forward to some nice family time. I miss my daughter a lot this year. She is in S Korea for the third Christmas in a row. We do have Skype at least. I'm going to mak myself a tea and finish up the hand stitching. Today, I'm going to our last UFO before Christmas. We are doing a lunch pot luck. I look forward to a day of relaxation which is a treat this time of year. I'm taking a basketful of hand stitching. Yesterday, I spent the day finishing up lots of little things. I went through my box of fabric prints and stitched up a lavender sachet with this linen one. It's a screen print with one of my own designs. 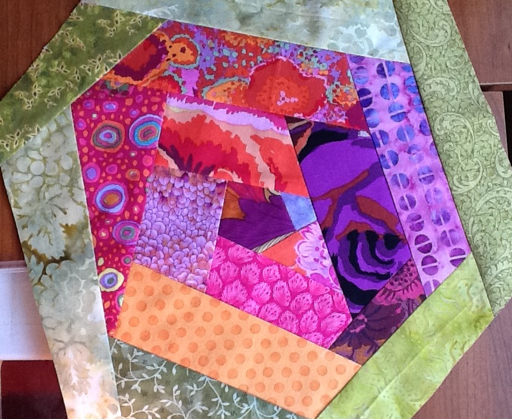 Then, I sewed together and stuffed two more sachets from fabric onto which I had printed some of my artwork. I like to keep lavender in my linen closet. It makes the bedding smell so good! This is a mug rug that I had put together a while ago. I got the binding sewn onto it. 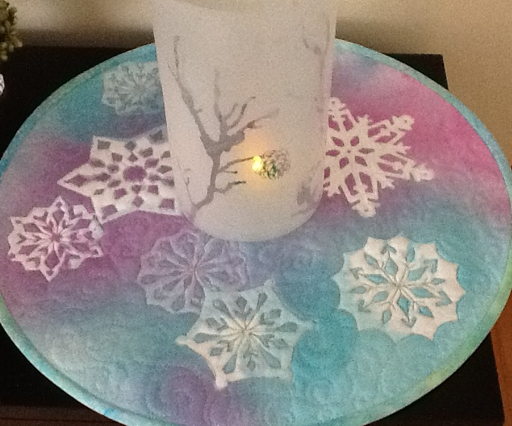 Sewing some sparkle onto my snowflake centrepiece using Hollow Shimmer was the most fun! Today was mostly an errand day for me after my swim. I did manage to wrap my first gift though! I was inspired by Alicia Burke's here. 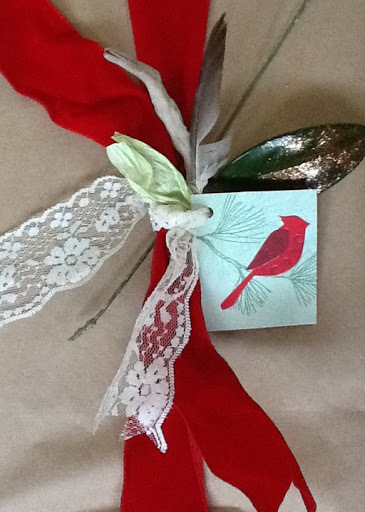 I used a bit from both and added a piece from a recycled Christmas card for the tag. Also, the red velvet ribbon is recycled. My kids laugh at me when I save all that stuff, but it's sure fun to reuse it. I was sewing this afternoon, but on a small Christmas gift, so it'll have to remain a secret. This was the view out my studio window. It's been snowing all afternoon. I put the Christmas lights on to greet my husband. It must have been pretty with the snow! 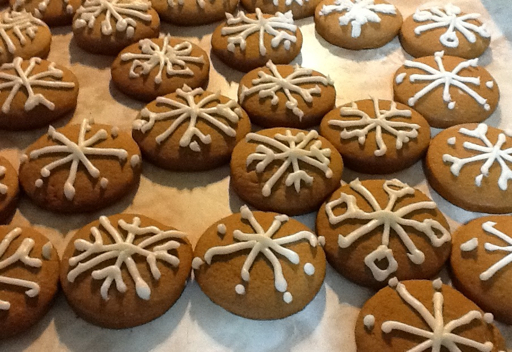 After I took a little break for some chai tea , I frosted my gingerbread cookies with snowflakes. They're not perfect but they taste good! With Christmas activities taking up more of my time, I'm not getting a lot of sewing done. I'm still working on one small gift, so i don't have much that i have to finish. Yesterday, I spritzed some fabric paint onto the piece I showed on my last post. 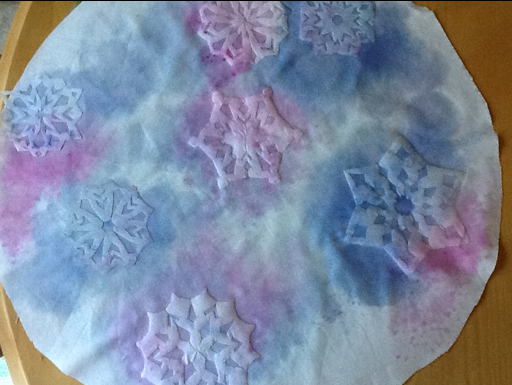 Then I anxiously waited for it to dry so I could add another few flakes and spritz on more paint for a layered look. The waiting was on again. I admit to taking a few little peeks, but I was afraid to lift too much lest the paint would migrate. I was so excited with the final results! It took two attempts but I got it! I really love this and I look forward to quilting it with some fun threads. 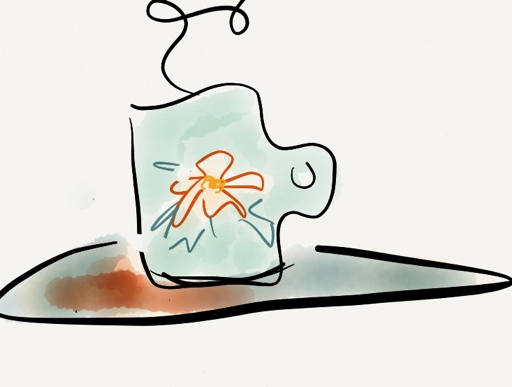 Since I vowed to make my blog not just about the finished product but also about the process, you get to see lots of less than pretty results. 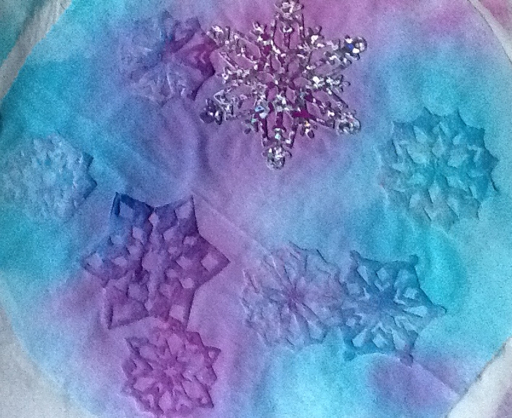 When I removed my snowflakes from the fabric last night, there were no nice white flakes. The paint had seeped underneath. The only thing that I did differently was that I sponged on the paint as opposed to spritzing it onto the fabric. I had also added spray baste to the back of some. So, being stubborn, I'm giving it another go. I've spray basted along with ironing them down. I picked up that large silver one from the Dollar store today. 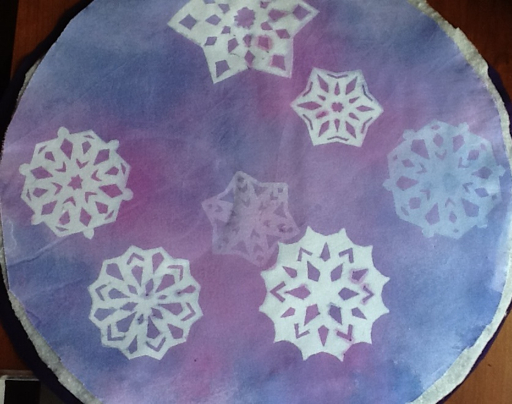 I'm ready to try again, but just in case I'm less than satisfied, I've cut out some funky snowflakes and put them onto a rather wild batik background. I've got lots to keep me busy this weekend! Besides painting and sewing, I'd like to bake some gingerbread and get a bit more decorating done. I found good directions here for folding and cutting snowflakes, and I cut some more from freezer paper that I'm quite happy with. The smallest is about 2 1/2 inches and the largest about 31/2 inches, not so easy to cut! Then I ironed them to a circle of white cotton and just before dabbing on the paint with a loofah sponge, I spritzed the fabric with water to dampen it. I've left the paper on because I'm thinking the color may be drying a little too pale and I may need to deepen the color. I will be adding more layers though. I've also been slowly working on reorganizing my painting area. To make room for the new electric fireplace, we had to move this large Roxton TV cabinet. I've repurposed it for my art supplies and its perfect. All I need to do now is make some labels for the containers. Someday, I'd love to paint it. Now if I could just get some Christmas decorating done! It's more fun to paint and sew! Does anyone else wonder what happened to all that time we thought we had before Christmas? While I try not to stress myself with last minute gifts, I thought I had lots of time to do a few but I'm not making the progress I had hoped. Well, I'm working on extra little things anyway, so that's OK. 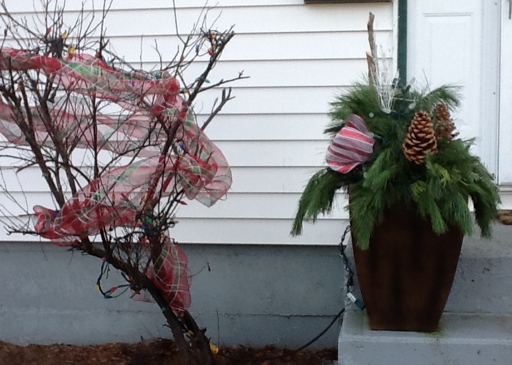 It was brought home to me just how close the holidays are while I was outside this morning putting lights on a couple of our bushes. After lunch, I sewed the binding onto my table runner. It still needs to be hand stitched to the back, but it's presentable enough to take to our guild Christmas dinner tonight as a show and tell. Another reminder of the approaching holidays! This next picture is the beginning of an idea I had for a round table topper. 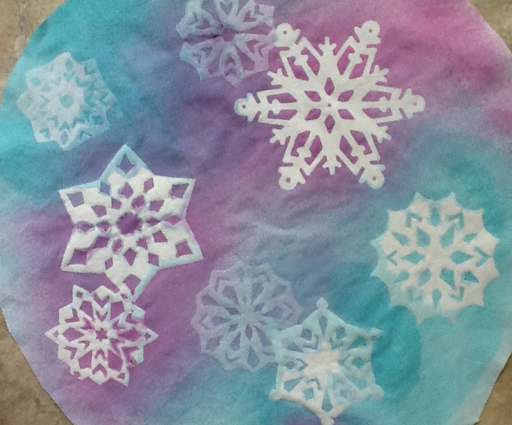 I used some snowflake designs cut from freezer paper, ironed onto white cotton. Then I spritzed it with diluted fabric paint. I'm not sure about this one; I don't like the rounded edge to the snowflakes. 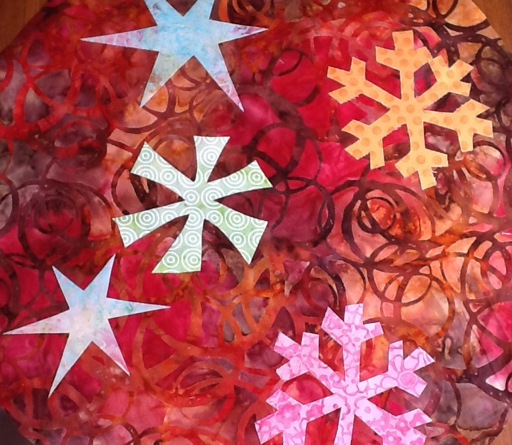 I think I like where it's going though so I may cut more snow flakes and start another one. At the same time I will experiment and add another layer to this one. I picture adding some deeper turquoise, some free motion stitching and some glitter. Despite my stress this morning at meeting a deadline (I'll tell you about it soon), it has turned out to be a rather happy day. 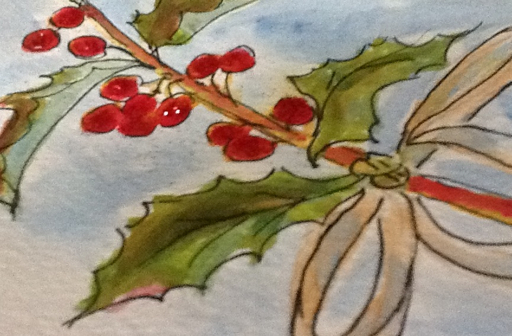 After a quick walk at lunch time, I decided I needed a little painting time which always soothes me. I have two holly bushes in my yard that I snipped bits from. 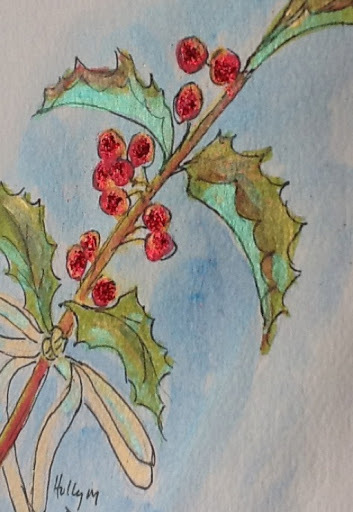 I painted two more Christmas cards. The only thing I need to do now is to start sending them! It is that time isn't it? I added a little sparkle to the berries. I really must figure out how to catch it better in the photos. 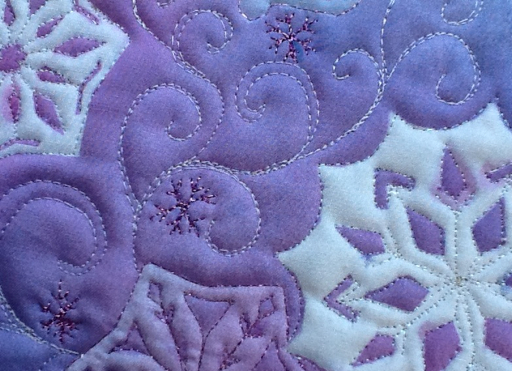 At UFO day on Saturday, I quilted my table runner. I've cut the binding and hope to get that on this week. Two things came in my mail today that excited me! First the latest Quilting Arts which I can't wait to read. My friend Margaret Applin has an article in it. The big surprise was a package from the Sew Sisters quilt shop. In it were a t-shirt and several batik fat quarters along with a pin and a note of thanks for participating in their Blogathon. How thoughtful and generous! It was my first time participating in such a thing and I am quite amazed! I just got up from some thread painting at my sewing machine to go make myself a cup of tea. On my way I checked the mail and found this gift that I won from Leslie . What perfect timing. I've been trying the pads out instead of wearing gloves and I must say I'm convinced! No more having to pull the gloves off every time I need to rethread or even wipe my nose. I'm sorry I don't have much to show right now. I've had to temporarily put my Christmas sewing aside to meet an unexpected deadline. So that means I can't show it! Tomorrow I'm going to UFO day and I'm hoping to get time to free motion quilt my Christmas runner. Have a great weekend! As it's really cold here, I'll say stay warm. I'll definitely be putting on the new fireplace tonight. It's a sunny but cold day again today. I believe it was around -1C when I went for a walk around noon. I made my first batch of Christmas cookies this morning, a new recipe I found in a grocery flier for cranberry pistachio shortbreads. They're shaped into a roll like an ice box cookie and after chilling, are sliced and baked. Of course I had to sample one! I'm trying to be good and keep loosing weight so I'm not going to bake a lot this year. 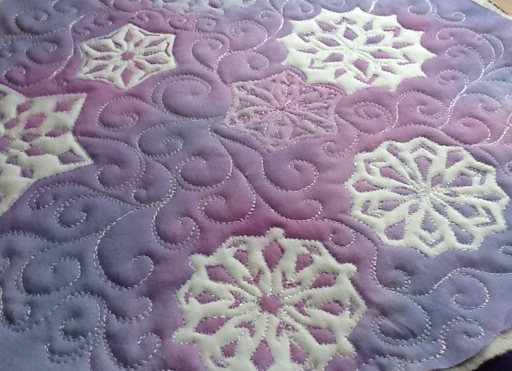 Yesterday, I finished stitching down all the snowflakes on the runner and this morning I sandwiched it to take to UFO day on Saturday where I'll free motion quilt it. Since I had such fun the other day playing with the paints and glitter, I also did three more cards. I've slowly been trying to get projects finished and decided to try machine stitching the binding onto this piece. I haven't figured out how to make it even. As you can see its a little wider in some spots. Can I live with it? I'm not sure yet. 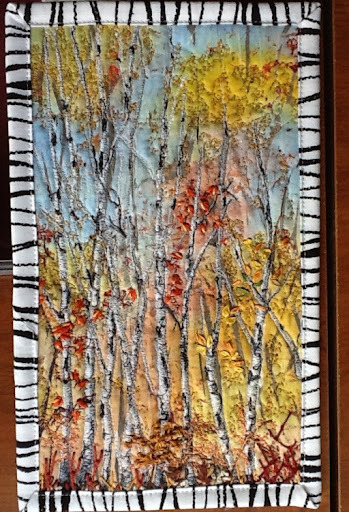 This not a very large piece, and is heavily thread painted as well as hand embroidered. I debated how to finish it off. Should I zigzag it? That seemed kind of unfinished by itself and since it has batting in it like a quilt, I didn't really want to frame it. In the end I opted for the simple binding. Now that I see it on the screen, I quite like the binding fabric but don't think I can live with its unevenness. Does anyone have any hints or suggestions? I did get a line of bedding hung on the line and went for a walk with my husband at noon. We were bundled up against the brisk cold wind and so enjoyed the bit of sun. For the rest of the day, I stayed inside getting into some creative fun. 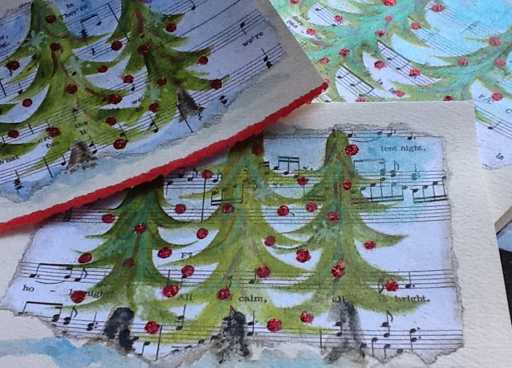 Before the sewing, I glued down Christmas music to three more cards in perpetration for painting more trees. I've since added a thin layer of clear gesso so they'll be ready to paint onto tomorrow. I actually ironed the first one That i showed last post at this point to flatten it out. 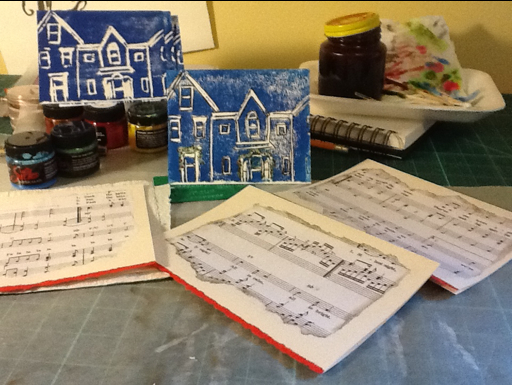 The blue houses you see are some cards that I printed using a homemade stamp a few years ago. I didn't care for them at the time but now I've decided that it might be fun to decorate them for Christmas. Then I turned on my fire and curled up with a cup of tea. How was your Monday?